Brandywine Cottage is David Culp's beloved two-acre Pennsylvania garden where he mastered the design technique of layering—interplanting many different species in the same area so that as one plant passes its peak, another takes over. The result is a nonstop parade of color that begins with a tapestry of heirloom daffodils and hellebores in spring and ends with a jewel-like blend of Asian wildflowers at the onset of winter. The Layered Garden shows you how to recreate Culp's majestic display. It starts with a basic lesson in layering—how to choose the correct plants by understanding how they grow and change throughout the seasons, how to design a layered garden, and how to maintain it. 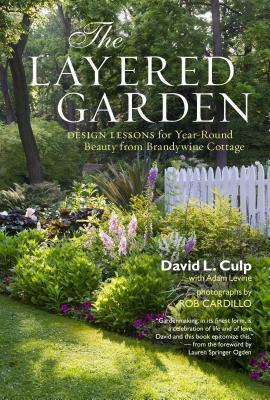 To illustrate how layering works, Culp takes you on a personal tour through each part of his celebrated garden: the woodland garden, the perennial border, the kitchen garden, the shrubbery, and the walled garden. The book culminates with a chapter dedicated to signature plants for all four seasons. Along with his partner, Michael Alderfer, David L. Culp is the creator of the gardens at Brandywine Cottage in Downingtown, Pennsylvania. David has been lecturing about gardens nationwide for more than 15 years. His articles have appeared in Country Living, Fine Gardening, Green Scene, and many other publications. He is a contributing editor to Horticulture magazine and served as chairman of the Middle Atlantic Hardy Plant Society. The garden at Brandywine Cottage has been featured several times in Martha Stewart Living and on HGTV. Adam Levine is an award-winning garden writer whose work has appeared in several books as well as many regional and national magazines. He lives and gardens in Media, Pennsylvania.